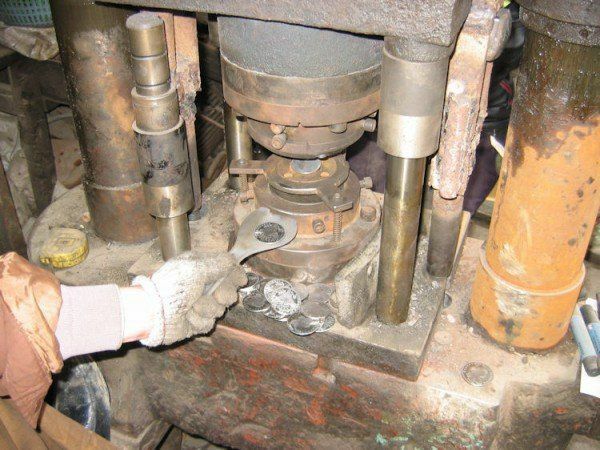 This photo depicts a worker in a Chinese counterfeiting ring in the process of feeding a planchet (coin blank) into the press to strike a fake silver coin. The counterfeiting ring whose equipment and products are shown in this photo gallery is a large, well-funded organization that employs numerous people in a factory-like environment. In addition to striking fake coins, they manufacture a variety of fake Chinese antique art and antiquities items. This photo shows a different coin press than the one in the previous photo. This one is striking fake Morgan Dollars. This is a closer photo of the coin press in the previous image. Several freshly struck fake Morgan Dollars lie to the right of the machine. They look like they might even be Proof Morgans, which would almost certainly be struck on a machine that uses hand-fed coin blanks, but some of the machinery in this operation looks pretty old so maybe they're just normal Morgans after all. Whatever quality of striking they have, whether it be Proof or normal, one thing is certain: they're FAKE! Counterfeit Morgan Dollars made by a major Chinese fake coin operation. Photo courtesy of Jinghua Shei. Here's a close-up image of a few freshly-minted fake Morgan Dollars struck in China. I don't know if they were struck by the coin press on the previous page, or one of the several other coin presses this counterfeiting ring has, but those fake Morgans sure look to be pretty high-quality counterfeits. Of course, this counterfeiting ring will process them so that each one appears to have a different amount of wear, toning, contact marks, and other minor imperfections so that they don't all look too much alike. Some of these fake Morgan Dollars will also find their way into counterfeit PCGS and NGC slabs, but my sources tell me that most of the fakes these counterfeiters sell are sold "raw" (rather than slabbed). Here is an edge view of the same handful of fake Morgan Dollars shown on the previous page. Again, what stands out most to me is the high quality of these fakes. The coins may or may not have been struck on genuine .900 fine silver planchets, though. The Chinese have been experts at creating lookalike alloys for more 1,500 years. Here's another one of the coining machines in use at this large Chinese coin counterfeiting factory. A worker, who looks to be a woman, is operating a machine that applies edge lettering to the edges of the struck coins. This machine is somewhat different from the Schuler edge lettering machine in use at the U.S. Mint for the golden dollars. According to reader Henry N., this one operates more like a Castaing Machine, which was the first machine ever developed for the express purposes of putting edge lettering and other marks on the edges of coins. Minting experts Mike Diamond and Fred Weinberg also concur, based on what they can see in the photo, that the machine is applying edge lettering. Reader Kostas K. pointed out that if you look carefully just to the left of the large tube, you can actually see a coin traveling through the machine! In order to strike coins, you need coin dies, and the Chinese counterfeiters are making some fairly high-quality ones, as this photo indicates. Most of the dies shown here are of various American silver dollars, although I see a couple of Indian Head Cent dies and some foreign coin types. This close-up photo shows the high quality of these dies for making fake silver crown-sized coins. The die on the right is the reverse of a British silver crown dated 1899. The die on the left is the obverse of a silver Greek 5 Drachmai dated between 1833 and 1845. Although the British Crown, if genuine, would sell for a few hundred dollars, the Greek coin made by these dies would cost thousands. Of course, each coin die can strike tens of thousands of specimens, making this a very profitable operation! Here's another one of the Chinese counterfeiting ring's coin presses, this time being operated by two men. As you can see, the machinery looks pretty old and maybe not very well maintained. Certainly, it's very filthy, but the work these men are doing is filthy in itself, making counterfeit rare coins to pollute our coin collecting marketplace. This wide-angle shot is deceiving at first. For perspective, consider that the blue stool in the middle of the photo is a full-sized step-stool type of seat. All around it are boxes and boxes of Chinese-made fake silver coins, all neatly sorted into compartments. Many of these coins will end up in fake PCGS, NGC, ANACS, or other grading service holders, but the majority of them are sold ungraded. Some of them are even sold "legitimately" as "replicas" rather than as the genuine coin, but without a marking indicating that they're copies, it is easy for dishonest people to pass them off as authentic. Counterfeit coins made by a major Chinese fake coin operation. Photo courtesy of Jinghua Shei. Here's a little bit closer look at the coins in the many counterfeit coins this Chinese minting operation has struck. Most of them are silver-colored (although probably not made of real silver,) and a few of them are made of copper. Those boxes don't look very sturdy (remember, coins are quite heavy in these quantities, even fake ones,) yet my source tells me the coins are transported to coin shows in these cases. Of course, you won't see these boxes on the coin show trading floor! This sort of quantity is the type of deal done behind closed doors in private hotel rooms, but even there I doubt a buyer would see anything but the coins themselves. One last look at what's in the silk-covered trays - a close-up photo shows lots and lots of freshly-struck fake Standing Liberty Quarters! I also see Chinese-made fake Indian Head Cents, and what look to be maybe Large Cents and perhaps some counterfeit dimes and nickels. Counterfeit coins, bars, and other small obects can be seen in this showroom in a Chinese coin and antiquities counterfeiting operation. Photo courtesy of Jinghua Shei. This photo shows one of the showrooms for the counterfeiting ring. This is a little like a store, where customers can come in and buy smaller bulk quantities of the fake coins and other items made by this operation. Counterfeit goods made by a major Chinese fake coin operation. Photo courtesy of Jinghua Shei. Although my sources described this photo as a storage area, their English isn't the best, so I actually think we might be looking at another showroom type of place. The actual non-customer-accessible storage areas, as seen in other photos in this gallery, are much more cluttered and filthy. Counterfeit Indian Head Pennies and Large Cents made by a major Chinese fake coin operation. Photo courtesy of Jinghua Shei. This container is full of Chinese-made fake Indian Head Cents and fake U.S. Large Cents. The dates on the fake Large Cents include 1854 and 1857. Fake Indian Head Cents I have seen in their photos include 1869, 1870, 1871, 1872, 1877, 1908-S, and 1909-S. I've also seen photos of fake 1856 Flying Eagle Cents. As you can see, this ring seems to prefer making counterfeits of key coins and the other more valuable dates, sometimes to the point of absurdity, as in their fake 1913 Liberty Nickels. Don't be fooled, though. I've also seen plenty of more common dates. When it only costs you 2 - 4 cents per coin to make them, even selling them for a "paltry" $15 or $20 each is an excellent profit. And anyway, these guys claim they don't sell singles. They're self-proclaimed "replica wholesalers" and it's not their fault if other people misrepresent their merchandise. They claim they're merely filling a demand in the marketplace. Counterfeit coins and artifacts made by a major Chinese fake coin operation await sale in one of their many storage rooms. Photo courtesy of Jinghua Shei. This room is more cluttered and messy than some of the other presumably "showroom" photos, although this might be a showroom area, too. But really, storeroom or showroom, whatever you choose to call it, it's just as filthy when it is loaded with fake coins, antique art objects, and antiquities, all meant for Western collectors' markets. Counterfeit ingots and bars made by a major Chinese fake coin operation. Photo courtesy of Jinghua Shei. This Chinese counterfeiting ring doesn't confine its production to coins. They also manufacture other fake numismatic items, such as ingots, bars, and currency banknotes. This photo shows some of the fake ingots and bars, which are made of very debased metals. Counterfeit iron and bronze coins made by a major Chinese fake coin operation. Photo courtesy of Jinghua Shei. One of the most amusing ironies in this Chinese counterfeiting business (if any humor can be found in it at all,) is that these counterfeiters make and sell a vast number of fake Chinese antiquities. This is ironic because ​genuine Chinese antiquities are very common in China. Farmers find them in their fields every season. Graveyards have been found that contain literally millions upon millions of ancient Chinese coins and artifacts. However, the penalty for exporting these genuine cultural heritage items can be death, but the penalty for exporting replicas is only that you have to pay your business profit taxes like everyone else. Counterfeit antiquities made by a major Chinese fake coin and art operation. Photo courtesy of Jinghua Shei. In the batch of photos, my sources provided, there were a couple of dozen images that depicted the fake antiquities and art objects that this counterfeiting ring is producing. Since my focus is on covering coins and other numismatic items, I must limit the number of non-coin related photos I provide, but I did want to include a couple just to show the broad scope of this counterfeiting operation. These items might look like they were dug up from thousand-year-old graves, but my sources assure me they were just made last week. Counterfeit ancient coins made by a major Chinese fake coin operation. Photo courtesy of Jinghua Shei. These are some freshly-made fake Chinese ancient coins. 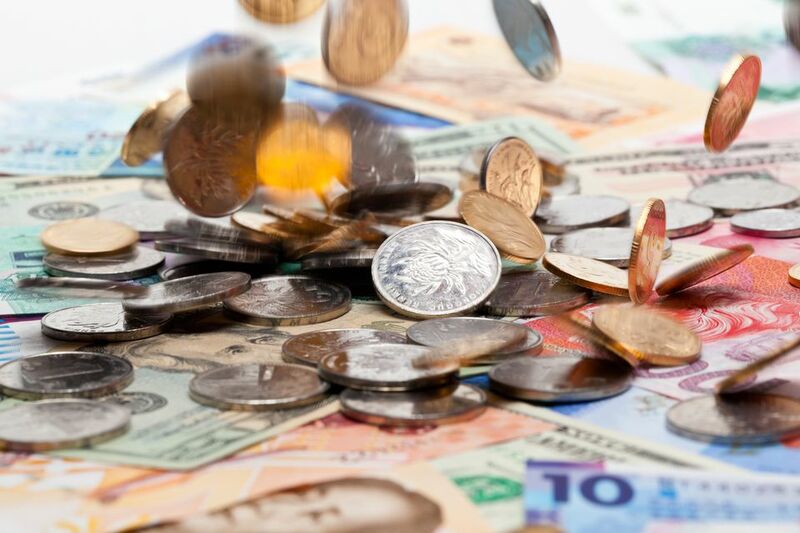 The coins are made by the same counterfeiting operation that makes the silver dollars, crowns, and other fake silver and copper coinage depicted in this gallery. Although the coins might appear to have been dug up from the ground, they are merely treated artifacts which were cast within the past couple of weeks. Counterfeit dynastic coins made by a major Chinese fake coin operation. Photo courtesy of Jinghua Shei. These coins, while fake, replicate the type of coin which has been made in China for at least 2,500 years. Genuine ancient Chinese coins are actually some of the most fascinating and low-cost ancient coins on the market, but with so many fakes coming out of China it is very dangerous to your pocketbook to collect them unless you know your stuff. Fakes like these can be very convincing to non-expert Chinese coin collectors. Counterfeit currency and tourist goods made by a major Chinese fake coin operation. Photo courtesy of Jinghua Shei. In the photos of the Chinese coin counterfeiting ring that my sources provided, there were very few banknotes shown. This photo is the best of the banknote bunch. The other items in the photo seem to be some kind of tourist-trade goods. In the back on the lower shelf, you can see coin dies for sale, for making your own counterfeit coins! Counterfeit coins made by a major Chinese fake coin operation await dispersal into our marketplace. Photo courtesy of Jinghua Shei. The coins in this photo represent an assortment of fake coins which have been processed after striking to make them look circulated or dug from the ground. The Chinese are experts at the art of processing newly-minted items to make them look old, and these coins are a typical example of this time-honored Chinese art. Counterfeit slabs made by a major Chinese fake coin operation. Photo courtesy of Jinghua Shei. This photo, provided to me by the Chinese coin counterfeiting ring, shows coins that have been put in slabs, or coin holders that have a grade on them. It's kind of amusing to see notations like "AU 55 Details - Cleaned," as if the coin is a genuine About Uncirculated 55-graded coin that has been damaged by cleaning, rather than the outright fake that it is! Unfortunately, such dissembling really fools people because I have argued many times with people who refuse to believe that counterfeiters would go to the trouble to make a fake coin and then degrade its value by damaging it. The counterfeiters know that the damage makes the coins more acceptable to many people because it allays suspicion about the authenticity of the coin in these people's minds. The fake slabs on this page are not the PCGS or NGC type that has been in the news recently, but there is no doubt at all that the coins this operation is making are being placed into the fake grading service holders of these companies.